Here's a brief look at the Minolta AF II APO teleconverters. Scroll down for more info. Both come with front and rear caps, plus a nice carrying case. That all depends. For Sony users, not a very good value. See Sony teleconverters review here. No auto-focus on Sony lenses. 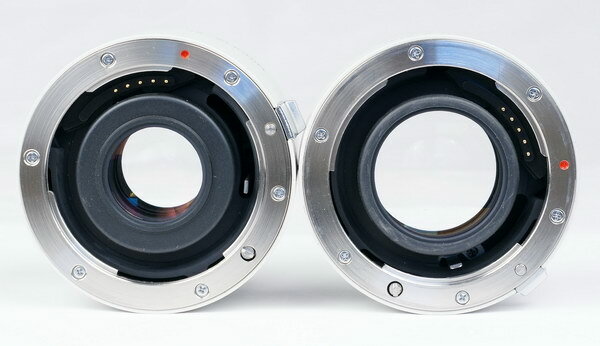 They work on other select Minolta lenses, see below. Specifications compiled using various Internet sources. 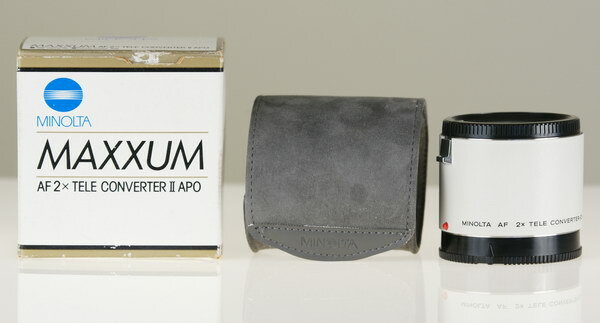 1.4X or 2.0X of the attached lens. Rear view, 1.4x on right. Front view, 1.4x on right. 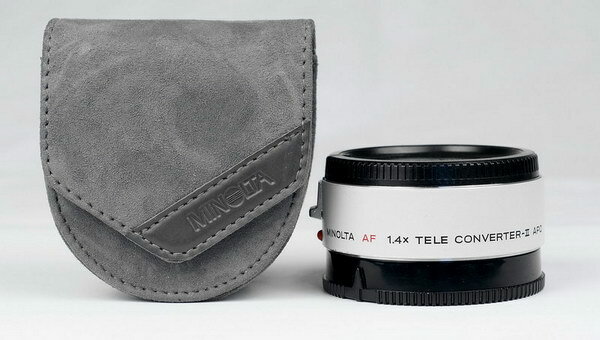 The Minolta AF II APO teleconverters are frequently found on eBay. They're quite a bit less expensive than their equivalent Sony models, but you won't get auto-focusing on any Sony lenses. They aren't compatible with SSM focusing. They will meter correctly and provide proper EXIF data. 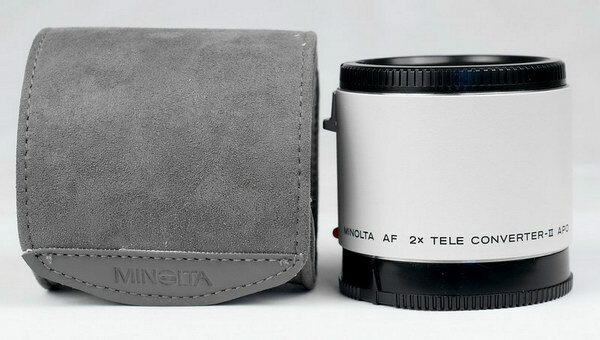 The Minolta AF II APO have updated gearing for high-speed focusing as opposed to the older Minolta AF APO models. They are both multi-coated and have a predominately amber color. Compatibility: for the most part, the Minolta AF teleconverter II APO 1.4x is fully compatible with the Minolta 200mm F/2.8, 200mm F/4 macro, 300mm F/2.8, 300mm F/4, 400mm F/4.5 and 600mm F/4 including all HS-APO G models of each lens. The 2x teleconverter is fully compatible with the Minolta 200mm F/2.8, 300mm F/2.8, including all HS-APO G models of each lens. Optically, they're the same as the new Sony models, but without the ability to auto-focus on Sony lenses. If you're building a Sony DSLR system, do not buy these teleconverters, pay the extra money and get a full functioning 8 pin Minolta APO (D) or Sony. Note: the Sony 135mm F/2.8 STF lens will accept teleconverters, but will not auto-focus by design, and is not an auto-focus lens. 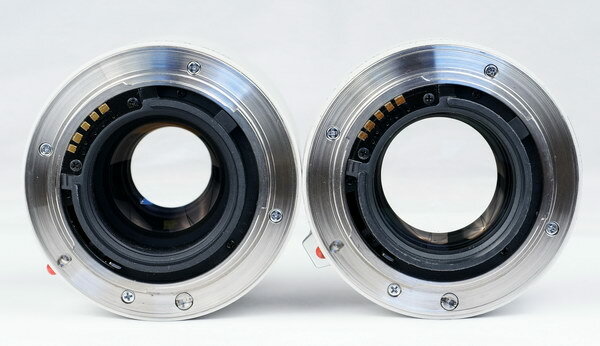 For a full review of the Sony models, and a basic look at what the picture quality would be with these teleconverters mounted on a Sony 70-200mm F/2.8 G SSM lens, go here.